Herbal tea is made from many plants, using not just the leaves, but also the flowers, roots, bark and seeds. These teas are preferred for their physical or medicinal effects, especially for their stimulant, relaxant or sedative properties. Made with naturally caffeine free Organic African rooibos tea, also known as red tea, this Mighty Leaf signature rooibos blend teems with tropical fruit and blossoms. A lush herbal tea highlighted by the clean notes of mint and basil. Primula PTW-2340 DST PTW-2340 DST Teas of the World Tea Set (Tempo Round 40 oz Glass Teapot and Stainless Steel Infuser with 2 Herbal Infusion Tea Packs, 6 Rose & Black Tea Packs, 6 Green Tea Packs, 2 Flowering Teas and Keepsake Bag) Teas o Type: Kettle Set Features: Teas of the World Tea Set includes a Tempo Round 40 oz. Glass Teapot with Stainless Steel Infuser, 2 Herbal Infusion Tea Packs, 6 Rose & Black Tea Packs, 6 Green Tea Packs, 2 Flowering Teas in a Keepsake Bag. 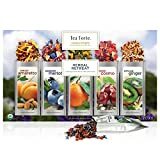 Twining's of London Assorted Herbal Teas includes Pomegranate & Raspberry, Nightly Calm, Orange & Cinnamon Spice, & Pure Chamomile tea. A selection of four delicious herbal teas to suit all your needs and desires! Refreshing and bold, the fresh taste of pure peppermint cleanses your palate and leaves you feeling invigorated. 20 tea bags per box. Premium Shangri-La tea in pyramid-type sachets. A classic with honey overtones. Relax with this one. Caffeine free. Organic, 15-count box.